In the following I will argue against the paraconsistent acceptance of inconsistencies. I also question the acceptance of logical explosion and logical triviality by classical logicians. As C.I. Lewis once claimed (quoted by Bryson Brown), no one “'really accepts contradictions'”. From that it can be said that the prime motivation for paraconsistency - as can be gleaned from some paraconsistent logicians themselves (at least implicitly) - is entirely epistemological and, sometimes, also based on positions and findings within science (specifically physics). The following positions are also seemingly at one with the position of David Lewis who argued that it's impossible for a statement and its negation to be true at one and the same time. Having said that, all this depends on what's said about the embracing of both A and ¬A; as well as how it's defended. A related objection is that negation in paraconsistent logic isn't (really?) negation; it's merely, according to B.H. Slater, a “subcontrary-forming operator”. Bryson Brown and Graham Priest also call negation (or it) “denial”. Indeed Priest explicitly states that paraconsistent negation isn't (Boolean) negation. Thus if the acceptance of inconsistencies is an epistemological move (as I argue), then that move isn't “really” an acceptance of both A and its negation at one and the same time. As already stated, Bryson Brown says that “a defender of [C.I.] Lewis's position might argue that we never really accept inconsistent premises” (630). I'm prone, prima facie, to agree with that. Indeed Bryson immediately follows that statement with a defence of inconsistency which doesn't seem to work. Brown says that “[a]fter all, we are finite thinkers who do not always see the consequences of everything we accept”. Perhaps C.I. Lewis's reply to that might have been that we don't “accept inconsistent premises” that we know - or that think we know - to be inconsistent. Sure, having finite minds is a limit on what we can know. Nonetheless, we still don't accept the conjunction A ∧ ¬A; at least not in its (empty) symbolic form. Though it needn't always be entirely a problem of symbolic autonyms. Paraconsistent logicians don't accept 1 = 0 either; and we don't accept the disjunctive statement “John is all black and John is all white”. As for not seeing consequences of our premises: no, we don't – not of every premise (or proposition) we accept or even know. Though we do know the consequences of some of the premises we know! The finiteness of mind doesn't stop us accepting certain premises - or even whole arguments - either. Still, Brown may only be talking about premises which we're not sure about. In such cases then, sure, the limitations of our minds is salient – we can't know all the consequences of all the premises we accept and we can't know if they're all truly consistent. Dale Jacquette puts the paraconsistent position when he says that “logical inconsistencies need not explosively entail any and every proposition” (7). What's more, “contradictions can be tolerated without trivialising all inferences”. There we have the twin problems (for paraconsistent logic) of logical explosion ( or ex contradictione sequitur quodlibet) and logical triviality. then P is assumed to be true. So far, so good (at least in part). If the conjunction P ∧ ¬P is assumed to be true (which paraconsistent logicians accept, though others don't), then of course P (on its own) must also be true. Here, the inference itself is (kind of) classical; even though the conjunction of P and its negation isn't. ii) From i) above, it follows that at least one of the claims, P, and some other (arbitrary) claim A, are true. This is where the first problem (apart from the conjunction of contradictories) is found. It can be said that some proposition or other must be the consequence of P; though how can that consequence (A) be arbitrary? An arbitrary A doesn't follow from P. Or, more correctly, some arbitrary A may well follow; though not any arbitrary A (this is regardless of whether or not A, like P, is true). Thus perhaps this isn't about consequence. A, instead, may just sit (i.e. be consistent or coherent) with P without being a consequence of P; or without it following from P. Thus if A isn't a consequence of P (or it doesn't follow from A), then the only factor of similarity it must have with P is that it's true. Though, if that's the case, why put A with P at all? Why not say that P is arbitrary too? If there's no propositional parameter between P and A, and if A doesn't follow as a consequence of P, then why state (or mention) A at all? Moreover, why does A follow from P? iii) If we know that either P or A is true, and also that P is not true (that ¬P is true), we can conclude that A - which can be anything - is true. Thus if a theory contains a single inconsistency, it is trivial — that is, it has every sentence as a theorem. There are two problems here, both related to the points I've already made about logical explosion. Why does an “inconsistency” have “every sentence as a theorem”? Sure, if this is true, then one can see the triviality of the situation. Nonetheless, I simply can't see how the conjunction P ∧ ¬P generates every sentence as a theorem; or, indeed, even a single sentence. Strictly speaking, the conjunction P ∧ ¬P generates nothing! At the beginning of the last paragraph I confessed to rarely having seen a logical defence of logical explosion – only bald statements of it. However, Bryson Brown does present C.I. Lewis's proof of logical triviality (the bedfellow of explosion). Nonetheless, before that Brown says that “this defence [of Triv] is just a rhetorical dodge”. And that's how I see it. It seems that the logical rule that “from any inconsistent premise set, every sentence of the language follows” is rhetorical in nature. If relevance logic is a type of paraconsistent logic, then that may well be relevant to some - or many - of the points raised above about explosion and triviality. My point is that if relevance is a logical stance, then nothing explodes from accepting both P and ¬P because it's not the case than an arbitrary A can follow from a conjunctive inconsistency. Nor does it follow that if both P and ¬P are part of a theory, it trivially brings about every sentence as a theorem. On the other hand, if we accept relevance, then the very acceptance of a conjunctive contradiction (or inconsistency) may also be problematic. If both P and ¬P are accepted, it's hard to see relevant derivations or consequences which follow from contradictory propositions. For example, what follows from the propositions “The earth is in the solar system” and “It is not the case that the earth is in the solar system”? Taken individually, of course, much follows from either P or ¬P; though not when taken together as jointly true. then A and B share a non-logical constant (sometimes called a propositional parameter). can't be a argument in relevance logic. i) Jesus H. Corbett is dead. ii) Jesus H. Corbett is not dead. iii) Therefore Geezer Butler is a Brummie. This isn't the classical logical point that two true premises necessarily engender a true conclusion regardless of the propositional parameters of the premises and conclusion . In the classical case, the premises can be genuinely true, along with the conclusion. In addition, there's no contradiction even if the premises and conclusion aren't semantically related. Now take logical explosion. In this case, the premises above engender all statements or theorems because they're contradictory. The propositional parameters are irrelevant, only the truth-values of the premises and conclusion matter. Not only that: we have “proved” that Geezer Butler is a Brummie from the premises “Jesus H. Corbett is dead” and “Jesus H. Corbett is not dead”. Jacquette, Dale. (2002) A Companion to Philosophical Logic, Introduction. Lewis, David (1998) . 'Logic for Equivocators', Papers in Philosophical Logic. Cambridge: Cambridge University Press. pp. 97–110. Slater, B. H. (1995). 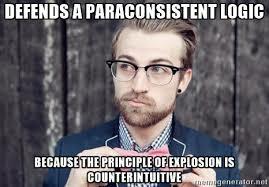 'Paraconsistent Logics? ', Journal of Philosophical Logic. 24 (4): 451–454.